Talk to Phoenix Coyotes general manager Don Maloney about Connor Murphy, the team's first-round pick in 2011, and he gets excited about the youngster's potential as a top-end NHL defenseman. A 6-foot-3, 190-pound blueliner with the ability to quarterback a power play while also being a strong presence in his own end, Murphy is a smart player with solid bloodlines -- his father, Gord, played for four teams in 14 NHL seasons and has spent 10 seasons as an NHL assistant coach, the past three with the Florida Panthers. But for the past three seasons, Connor Murphy hasn't had much of a chance to show people just what he's capable of doing. Off-ice training for the 2009-10 season saw him suffer a stress fracture in his back that sidelined him for most of the season. He seemed to have recovered at the start of 2010-11, but then reaggravated the injury. With surgery not an option, Murphy spent most of the season in a body brace waiting for the break to heal. In total, he played 30 games. When he was healthy, however, Murphy drew the attention of NHL scouts. Despite playing so few games, he had seven goals and 11 points. 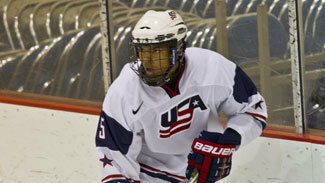 He really showcased himself at the 2011 World Under-18 Championship, when he had four points in six games, including the overtime goal in the championship game. 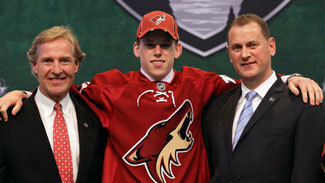 That was enough for the Coyotes to select him with the 20th pick of the 2011 NHL Draft. Not long after that, Murphy was invited to the USA Hockey National Junior Evaluation Camp and was off to a good start when disaster struck again. During a post-practice morning skate, he collided with goalie John Gibson and tore the meniscus in his right knee. Murphy's plan for after the Lake Placid camp had been to head to Sarnia to get ready for his first season in the Ontario Hockey League. The injury altered that schedule; instead, it was off to Phoenix for knee surgery and a long rehabilitation. After all he had gone through to recover from his back problem, Murphy said sustaining another serious injury affected him emotionally as much as it did physically. "The first couple days [after the knee injury] hit me hard," Murphy told NHL.com. "How much momentum I felt I had going into the season. … In an athlete's career there's a lot of ups and downs, and that was a down." He finally got back on the ice in December and had eight goals and 18 assists in 35 regular-season games with Sarnia, then added three points in six OHL playoff games. "It took a bit because it was a new league in the OHL in Sarnia," he said. "You can never get in complete game shape until you start playing games, so I was lucky enough to play a good amount of minutes in Sarnia. Just as we were getting going, 10 or 15 games in, is when you really start getting in the groove and your body gets used to the game schedule." Maloney said he was impressed by what he saw from Murphy last season in Sarnia, despite the small sample size, and that hasn't changed during this year's USA Hockey camp. "He's looked strong," Maloney told NHL.com. "He's 100-percent healthy and able to participate in this camp, which is great for us and great for him." Maloney said the only bright side to Murphy missing so many games the past few seasons has been the 19-year-old's off-ice development. "One of the positives about not playing, having the injuries he's had, he's been able to train, and physically he looks a lot thicker to me," he said. Murphy hasn't contributed offensively in his four games thus far at the camp, but he said he's enjoyed his experience far more than last year -- and not just because he's healthy. "It's been great," he said. "It's been a big difference from last year. You're a lot more confident. I kind of had the whole summer to prepare without the draft. It's great seeing all the guys, teammates from before [with the USNTDP]. Coming together with them again and keeping that chemistry you had going back when we were in Ann Arbor. It was really fun playing with the guys and competing again on an international stage. I was getting antsy working out in the summer and not getting back at it. So this has been fun." He even was OK with the hard hit he sustained late in the third period of Wednesday's game against Finland, when he was rammed into the boards by Finland's Heikki Liedes, who was given a game misconduct for checking from behind. "I'm feeling fine," he said. "They dumped into my partner's corner so I went in and tried to shake him off, and I thought I had him but he clipped me, I guess. I was lucky enough to feel fine and it's in the past." The hope now is Murphy can put his injury history in the past. "That's always something people say, but that's nothing you really control," Murphy said of staying healthy. "It's just staying in shape and doing stuff that I've learned now through working with a lot of trainers, through keeping strengthening and making sure you stretch and cool down after skates and workouts. I've really worked on my fitness in certain areas, injury preparation. That's why we do it, to stay on the ice as long as you can." Maloney knows that's the biggest thing Murphy needs to do right now -- stay on the ice. "There's nothing that compares to playing the game and competition, for timing and confidence," he said. "He looks good now and he's healthy and hopefully he can stay that way for a while."